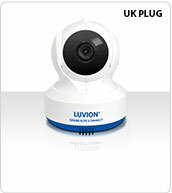 Separate camera with an UK plug for the Luvion Grand Elite 3 Connect baby video monitor. Please note that this camera only functions correctly with the Grand Elite 3 Connect and is not suitable for use with other models. Please note the Grand Elite 3 can't connect multiple cameras, you can only use this camera as a replacement.